By ALLAN MOULT | In 1994 Roger Butler, after nearly 30 years in advertising, got out. Not that he disliked advertising, for he and his fellow shareholders of Leo Burnett Tasmania, had built up the most successful advertising business in the state. But, after over 20 years as accountant, secretary and finance director, followed by account director, when the business was sold, it was time to look at doing something else. 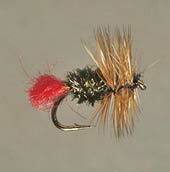 Three killer trout flies tied by Roger: The famous Red Tag, an enticing Blue Damsel, and the pink-bum Grasshopper — a Roger Butler orginal. After helping a mate successfully relocate and renovate an old house he decided to look at doing something less physically demanding and more personally rewarding to “keep him off the streets and out of mischief’”. 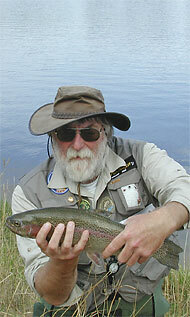 So in July 1996, Red Tag Trout Tours was created. 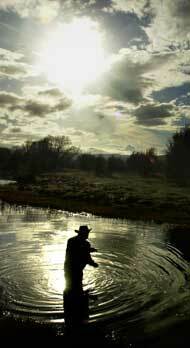 This enabled Roger to combine a lifelong passion for fishing (particularly fly fishing for trout) and a love of the beauty and tranquility of the Tasmanian outdoors with the personal interactive skills he had developed in the advertising industry. “I am not earning the income I was, but certainly believe it is a much richer and more rewarding lifestyle,” Roger says. Today he can count clients from all over the world — USA, Japan, Spain, Norway, UK, France, Singapore, Saudi Arabia, Canada, Finland to name but a few, not to mention every state and territory in Australia. As he says, “It makes for a very interesting and enlightening work environment. In what other business could you stalk a wild trout with a 90-year-old fly fisher from Canada, teach a grandmother from the Northern Territory to flyfish or help a 10-year-old from Kingston take his first trout on the fly? “Whether it’s introducing a skilled visiting fly fisher to the wild and wily Tasmanian brown trout or teaching a newcomer the joys of fly casting, the reward for me is seeing the pleasure reflected in their eyes of each and every success they have. Accredited with the Tasmania guiding industry body, Trout Guides & Lodges Tasmania Inc and subsequently acquiring Tasmanian Tourism Council endorsement, Red Tag Trout Tours is now an established part of this state’s growing and internationally acknowledged world quality tourism industry. Roger is still the marketing man: “Our activities endorsements include US cable TV coverage on the ESPN network’s Fly Fishing The World series, a segment on national television series The Great Outdoors — Andrew Dado and live fly fishing catch and release radio broadcasts with Warwick Hadfield on Radio Australia.” But the frenetic days of advertising are over.